“Ràdio Associació” Awards, established in 2000 with the intention of continuity by Societat Cooperativa Ràdio Associació de Catalunya, are intended to distinguish and reward professionals of Catalan radio and the best last year programs. They recognize between: Best Radio Program, Best Local Radio, Innovation Award and the Professional. Since 2003, in addition to the radio awards, the jury reward with the “Guardó 1924” the Catalan production in the audiovisual field, that is: television, advertising, cinema; Also: agencies, companies, creative, actors, presenters, managers, directors, programs, commercials, movies and so on. The “Guardó 1924” so named for being the year of the launch by the National Association of Broadcasting, the forerunner of Radio Association of Catalonia, the first spoken media: Radio Barcelona. During the awards ceremony, not only are awarded the contest Prizes but also Honourable Mentions in recognition of professional careers either people or media companies. Since 2012, the main prizes consist of a reproduction of a microphone of RAC reports from the thirties last century. 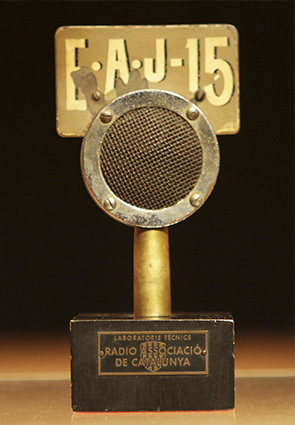 And since 2015, the “Guardó 1924” is a reproduction of a triode lamp of the first transmitter of Ràdio Associació de Catalunya. Ms. Imma Tubella i Casadevall. Original RAC micro. Reproduction awarded to the winners.